Workflow allows you to collaborate with multiple users on a single Submission. A common use of this functionality is to pass a Submission to another user for approval before it is submitted. We call that transaction a "handoff," and you can have as many handoffs as you need within a single App. Follow the instructions below or watch our video tutorial. Click on the name of the App you wish to enable Workflow for. Under Settings, find Workflow and click the Settings button. Then check 'Enable Workflow' box. Original submitter - This is the user that completes the first handoff in the Workflow. Final submitter - This is the user that completes the final handoff in the Workflow causing the Workflow to go to a completed status. The submitter of the handoff - This is the user that completes a specific handoff. Handoff name - This is the description for this "step" in the work flow. It's used for the status that is displayed on the Workflow page. You'll see it when this step is complete but the whole Workflow hasn't been completed. Handoff will occur after screen - Here you choose the screen that signals the handoff. After filling out the screen you choose, the user will be shown the handoff screen to send it to the next person. This can be any screen in the App. Next user can edit existing data - This allows the next user to be able to edit the screens already filled out by the initial user. If it's not checked then the data already filled out will be read- only. Next user has the option to reject - This gives the user recieving the handoff the ability to reject a submission. They can also write a note along with it to return to the sender. Email list - This a list of users made by you on the Workflow options screen. Email field - This can either be a Text or Drop Down field that holds emails. Workflow will pull the email from this field for the handoff. 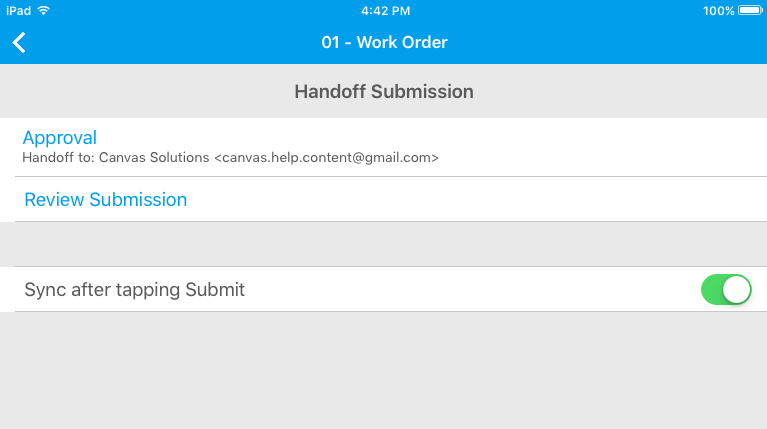 Next user begins at - Here you can choose whether the user receiving the handoff will start at the beginning of the App or at the screen where the handoff occurs. You can add more handoffs for the App by clicking Add Handoff at the bottom of the screen. A new handoff will appear and you will fill out the handoff options for this one as well. All the user has to do is choose an email to send the handoff to and then hit Done. Until the other user receives the Submission, the App will say there are Submissions to be sent. Note: The images you've taken for the app will be handed off to the next user with the rest of the data. Synchronize/refresh the mobile GoCanvas App. Once refreshed, the apps that have Workflows to be finished will have a symbol beside them like the one below. Click on the App you wish to fill the Workflow out for. Select the Workflow you want to continue. From there you can review or finish the Submission how you would like. If you are given the option to reject a Submission, the option will appear once you have the Submission opened under the menu. Click the menu button and hit Reject. You will have the choice of writing a reason or comment and then you hit Reject again in the bottom right of the screen. The Submission will be sent back to the user who sent it to you. Can I change how users are notified about Workflow handoffs? Can I see where a Workflow is after I hand it off? What are Workflow advanced notifications?